From the Mississippi River to the Illinois Waterway, invasive Asian carp have migrated closer to Lake Michigan, threatening the future of the Great Lakes if preventative approaches fail. “School of Jumping Silver Carp” by Jason Jenkins of the Asian Carp Regional Coordinating Committee is licensed under CC BY 2.0. A true fish out of water, Asian carp have become widely known for their photogenic jumping. Though whimsical, above water Asian carp pose a danger to recreational boaters while threatening the economy of the commercial fishing industry at the same time by their activities underwater. Asian carp are no stranger to Wisconsin waters. The nonnative fish have actually thrived in the state’s rivers and remote backwaters for decades. With no feasible means to do away with them, Asian carp are here to stay. But how far the species will spread may ultimately depend on an electric pulse. The introduction of bighead, silver, grass and black carp dates back to the 1970s when these four species, collectively known as Asian carp, were used to control weed and parasite growth on fish farms in the Southern United States by feasting on unwanted plankton and algae. It wasn’t until the flat gulf region flooded during the 1990s that Asian carp could escape to bodies of water in the Midwest, including Wisconsin. Unlike the common carp, which is also considered invasive, Asian carp reproduce at a faster rate and tend to be harvested less often because their bone structure makes them undesirable fare to eat. But Asian carp have the potential to be beneficial if managed responsibly. Sterile grass carp with three sets of chromosomes, referred to as triploids, could be used to keep golf course ponds, for instance, clean with reduced chances of repercussion if discharged into another body of water. “You could actually put these sterile fish in there and they would grow up and eat, but they would never be able to reproduce and at some point in time they would basically die of old age,” said Ron Benjamin, Wisconsin Department of Natural Resources fisheries supervisor for the Mississippi and Western Coulee region. The invasiveness of Asian carp is a menace to Wisconsin’s native fish, which are losing the competition for food and space to the species. Kelly Baerwaldt, U.S. Fish and Wildlife Service Asian carp eDNA Coordinator for the Midwest region fisheries, said the growing number of Asian carp eat the same food as native species. As a consequence, Baerwaldt said the observation of native fishes relative weight indicates how the number of healthy fish, as well as commercial catches, has declined. As the total population of Asian carp increases, space also becomes a premium. Titus Seilheimer, Wisconsin Sea Grant Institute fisheries specialist, said high concentrations of Asian carp not only crowd out native fish, but also cause other Asian carp to spread in search of more space. The commercial fishing industry would stand to lose the most if Asian carp were introduced into the Great Lakes. While several entry points exist, the Chicago Sanitary and Ship Canal (CSSC) is the most threatening passage into Lake Michigan. This manmade waterway connects the Mississippi River Basin, including the Illinois Waterway with a high concentration of bighead and silver carp, to Lake Michigan. With an inability to control Asian carp after they spread, along with the competition among native fish, the invasive carp’s biggest impact could be on the $7 billion fishing industry, according to the Wisconsin DNR. Yet, not all of the Great Lakes are appealing to Asian carp. Seilheimer said the depth and coldness of Lake Superior would not be very productive for Asian carp. 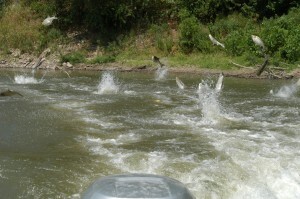 Asian carp are better at adapting to various physical environments than once believed. Until recently, much of the research on Asian carp came from China and Russia. Baerwaldt said based on their research of the species native to them, it was thought Asian carp could not spawn in backwaters disconnected from rivers nor do so in areas with less than a couple of miles of open river. At first glance, this information would make is seem as though Wisconsin would not be hospitable to Asian carp, however, the contrary proved true. “They’re making use of what’s available to them here and what we thought we knew about them, or maybe what was documented years and years and years ago in their native water, isn’t really what we’re seeing here, so you kind of have to take it with a grain of salt whether you think they can survive somewhere because what we have seen time and time again is they kind of flip the tables on us,” Baerwaldt said. Once introduced to a body of water, Asian carp are particularly adept at spreading rapidly. This makes eradication a nearly impossible feat, so preventing Asian carp from being introduced to new bodies of water becomes the next best solution. 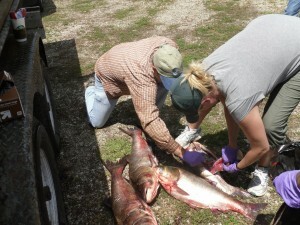 “Asian carp commercial fishing trip” by Sarah Gross of the U.S. Army Corps of Engineers is licensed under CC BY 2.0. When Asian carp are found, electric barriers can be used to prevent further spreading. Currently, there are three barriers on the CSSC, which consist of a track with steel electrodes lining the bottom of the canal that creates an electric field in the water as a pulse, generated in nearby buildings, cycles through the system, according to the U.S. Army Corps of Engineers. The electric current is meant to deter Asian carp and is the sole obstruction at the site between the Illinois Waterway and Lake Michigan. However, flooding is no match for the electric barriers as Asian carp could conceivably swim around the impediment in such an event. Fishing out Asian carp on the Illinois Waterway is also a preventative option, but not likely a worthwhile one. “We’ve taken almost three million pounds out, but they’re still there,” Baerwaldt said. Outside of being harvested by commercial fishing nets, Asian carp remain largely elusive for the average recreational angler in Wisconsin. “Asian carp are sporadically found and not readily caught on fishing lines,” said Bob Wakeman, Wisconsin Department of Natural Resources aquatic invasive species coordinator. Common carp are a hindrance to Wisconsin waters too, but one would be hard pressed to imagine what life would be like without them. This could very well be said of Asian carp someday since the invasive species aren’t likely to be going anywhere anytime soon. Like that of other invasive species which have plagued the state, resources will be devoted to limit invasiveness and the environmental community will learn from this species to prepare for future species to come. Only time will tell what that next invasive species of concern to Wisconsin will be.